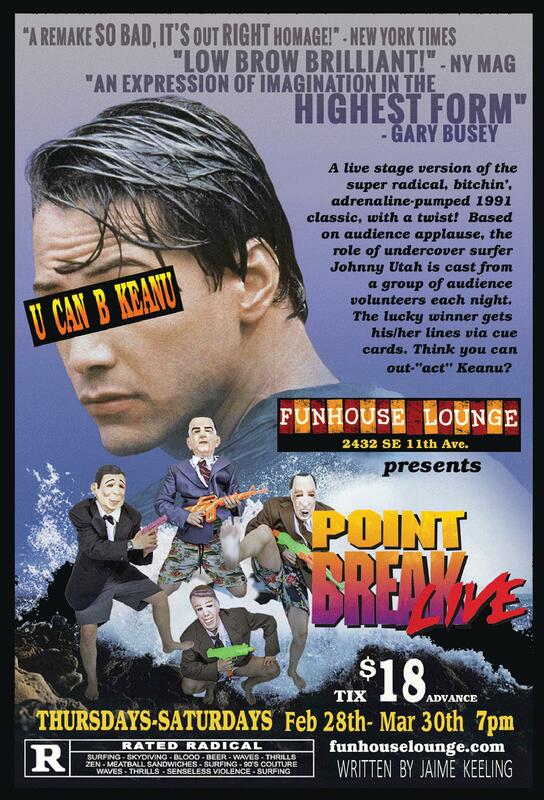 Funhouse Lounge is totally stoked to bring back last year’s hit: Point Break LIVE!, an over-the-top stage adaptation of the 1991 Keanu Reeves/Patrick Swayze extreme sports blockbuster,Point Break. The audience doesn’t just watch this show, they are part of it. Each night, the audience chooses who will play “Johnny Utah” from a group of audience volunteers who audition for the role. The lucky winner gets his/her lines via cue-cards so as to capture the *raw acting talent* of Keanu himself. But there’s more; from being robbed by bank robbers in presidential masks, to be doused with spray from the surf, the audience is fully immersed in this show (fake money and ponchos are available at the door). Point Break LIVE! ran for 9 years in San Francisco, 6 years in LA, and is currently enjoying a successful run in New York. Don’t miss out on what promises to be a totally tubular, bitchin’ rush like nothing else in Portland. Live the Ride, bra’! Tickets $18 in advance, $25 at the door.